The Holidays are in full swing here and well everywhere. 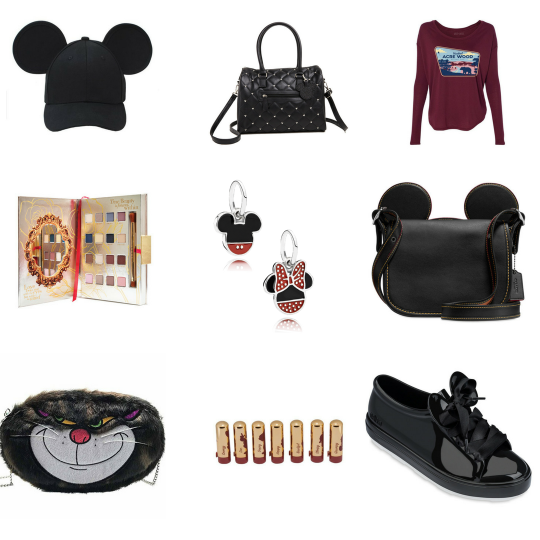 If you still have some shopping to do, here are some of our picks for any disney fashionista in your life. 1. Classic Mickey Ears Hat from CakeWorthy. We love a good classic Mickey Ears hat and CakeWorthy has a new one up for grabs, just in time for the Holidays. 2. Minnie Mouse Studded Quilted Handbag from Torrid. Tammy and I were in Torrid a few weeks back and saw this bag on display and we both went “OHHHH”. The studs are little Minnie Mouse heads making this bag is beautiful and understated. 3. Who’s It’s & What It’s Hundred Acre Tee. We all know I am a Winnie the Pooh fan and this tee from Who’s It’s and What’s It’s is at the top of my wish list. Even better is this tee is available in plus-sizes. 4. Beauty and the Beast LORAC PRO Eyeshadow Palette. If you have a makeup lover on your gift list, than this Beauty and the Beast inspired eyeshadow palette from LORAC is perfect. The palette has 16 different shadows housed in a storybook type palette. 5. DISNEYxPANDORA Charms. Any Disney fan needs a few of the DISNEY x PANDORA charms in their collection. Our personal favorites are the classic Mini and Mickey dangle charms, but there is a charm for everyone from the classics to the Alice and Wonderland to Cinderella. 6. COACH x DISNEY Mickey Ears Satchel. The COACH x Disney Collection is full of gift worthy items but our favorite is the classic Mickey Ears satchel. Perfect for everything from Mickey Mouse DisneyBounds to everyday use. 7. Danielle Nicole Lucifer Crossbody. Now if someone is looking for a more specific Disney character bag, look now further than Danielle Nicole. Her bags are spot on when it comes to bringing our favorite Disney Characters to live in fashion form. Our new favorite is this Lucifer (from Cinderella) crossbody. Not only is it a fuzzy but how often to you see ANY type of Lucifer merchandise? 8. Besame Cosmetics 7 Dwarfs Mini Lipstick Set. Walt Disney’s Snow White and the Seven Dwarfs celebrates it’s 80th anniversary this year and to celebrate Besame Cosmetics released their Snow White Makeup Collection. Our favorite is the 7 Dwarfs Mini Lipstick set. 9. Mickey Mouse Sneakers by Melissa. We’ve all seen shoes with Mickey’s (or Minnie’s) likeness in shoes, but seeing 3-D Mickey Ears on shoes is amazing. These Mickey Mouse Sneakers by Melissa shoes is a must-have for any Disney fan. 10. Disney Fuzzy Slipper Socks from Torrid. Cold weather means its time to get all nice and cozy with a mug of hot chocolate, a snuggle blanket, your favorite Disney movie, and cute fuzzy socks. Perfect to stuff those stockings with are these fuzzy socks from Torrid in various Disney characters. Next Post Holiday Gift Guide: May Your Kitchen Be Disney and Bright.